So 192/24 can be sent out over coax/SPDIF? I assume SACD and DSD files get converted to PCM in this instance? How does a SACD converted to PCM compare to 192/24 I wonder? I love the versatility of the Oppo I graciously won from nooshinjohn, I just don't like how it sounds compared to my vinyl setup. anyway. Get a great external DAC and raise the quality of all of your music. 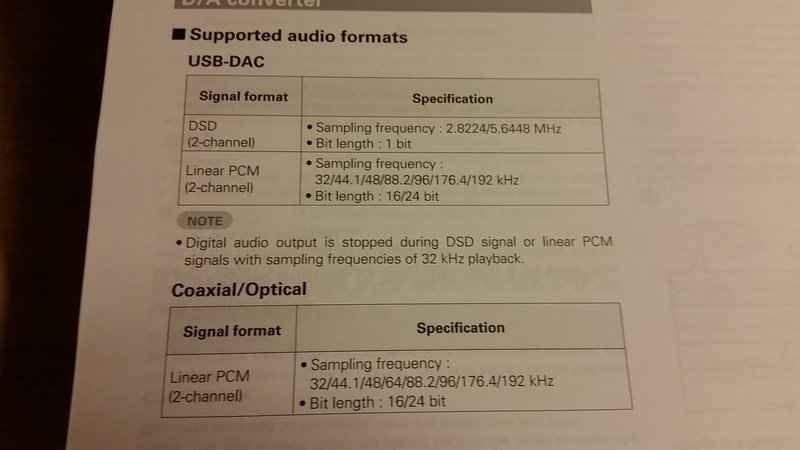 SPDIF (*Sony Philips Digital InterFace-the inventors of the Compact Disc-which is in this case the optical and coax outputs*) really wasn't designed to output anything much higher than about 48khz. I researched this awhile back and I believe that was the case before the hardware was capable of sending higher then 48 kHz on a single cable. Digital coax from what I understand is very capable of 24/192, has been used this way for some time. The issue is getting the full resolution of SACD, blu ray, or DVD-A into a DAC other than HDMI which is where the max of 48 kHz steps in due to copyright issues, or just use the analog out. In regards to the DAC in the Marantz, both the 8004 and 8005 use the Cirrus CS 4398A, the Oppo 103 and 105 use different DAC's, Cirrus CD4382A and the 32 bit ESS ES 9018 Sabre respectively. Reviews have the 105 on top as far as SQ but I've never heard one. I love the 8004 for 2ch CD, sounds wonderful. I am about to have this same problem,.I hope there is a 8006 that will adress this efore I buy an 8005. Thought about a new thread but want to continue on the info here. I haven't made any progress on this, but wanted to move forward. Been debating building a laptop or micro-atx size pc with a decent sound card, or a good external fact. What I'm looking to do is convert flac from a hard drive to coaxial dig, so I can input to my Marantz 8004. My other option is to change players but will seek options first. I figure it's easier to control the external hd with a pc or laptop but I really don't know the best option to maintain high SQ. I don't know about the (D) version BDP-103; but my standard BDP-103 outputs up to 24/192 via coaxial or toslink. Verified by the bit rate indicators on my Benchmark DAC2. Yes, the "D" version is the same, I have thought about trying taking the coax out of the 103D into the 8004. Im also now contemlplating the PS Audio NuWave DSD dac instead of upgrading to the 8005. I can keep my 8004 as a transport, but it will come down to SQ of the NuWave over the dac in the 8004/8005. I'd prefer to keep the number of components down and go for the 8005. Curious on opinions between the NuWave and the 8005. Doesn’t you marantz have a usb input? Yes, the 8005 has a usb input. Sorry...yes, as Machone stated, however it doesn't input the full 24/192 resolution through the USB, only the coaxial as the optical I believe tops out at 96kHz. Yeah, I don't know about the 8004 but 8005 does support the higher rez via usb.